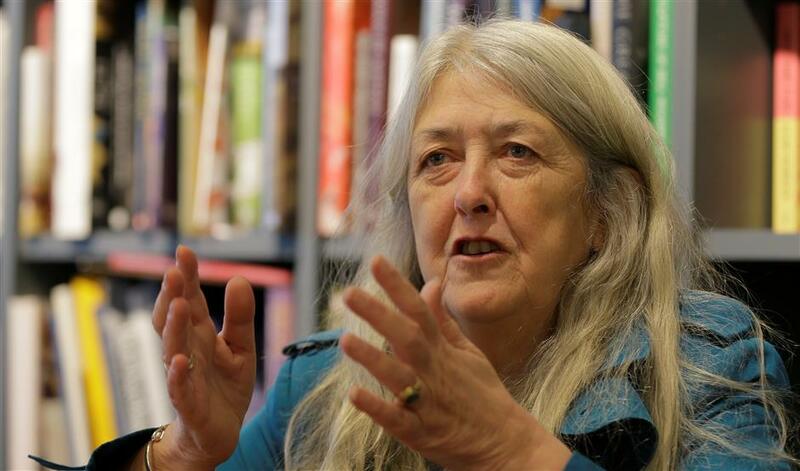 British author Mary Beard gestures during an interview talking about her new book “Women in Power” in London. The new book links Greek mythology to modern Twitter trolls, arguing both have a problem with women who speak up. The Cambridge University classics professor had been pondering the influence of the ancient world on modern political and public life when she came across mugs and T-shirts bearing an image from Greek mythology: The hero Perseus holding the bloody head of the snake-haired monster Medusa. In this version, Perseus had Donald Trump’s face and the monster bore Clinton’s. Beard asks how that ancient image ended up in a modern political campaign in “Women and Power,” a short but punchy book published Tuesday in the US by Liveright. The book explores the way images and ideas from ancient Greece and Rome have burrowed the way into the Western collective consciousness‚ and how many of them are about keeping women in their place. “When it comes to silencing women, Western culture has had thousands of years of practice,” Beard writes. Beard argues that modern ideas about public speaking are still shaped by its definition as a male thing. In the book’s second half she explores how power, more widely, came to be defined as something wielded by men. Those brains, she says, bear strong imprints from the ancient world. The monstrous Medusa is just one example, appearing repeatedly in art and satire. As well as Clinton, female politicians, including Angela Merkel and Theresa May, have been caricatured as the serpent-haired Gorgon. In contrast, when comedian Kathy Griffin posed with a fake severed Trump head, it prompted an outcry that saw her fired by CNN. In an echo of the ancient image, online abuse aimed at prominent women often includes threats to rip out tongues or cut off heads. “(It’s) the idea of cutting off, not just the brain and the beauty but the speaking organ of a woman,” Beard said. Beard, 62, is that rare thing: a celebrity academic. Her books are best-sellers, and hosts popular TV series on ancient Rome and Pompeii. As a well-known woman, she knows about online abuse first-hand. She has more than 166,000 followers on Twitter, where her willingness to tackle online trolls has made her a heroine for many younger women. “It doesn’t feel particularly heroic to me,” she said. Some of the abusers confronted by Beard have ended up apologizing. When Beard threatened to tell one troll’s mother what he’d tweeted, he said sorry and bought her lunch. Beard says she was drawn to study of the classical world by “a sense of wonderment” that she still feels. But she doesn’t shy away from its dark side. “But reading it in the wake of the Harvey Weinstein scandal, it seems utterly, dreadfully convincing,” Cooke said. The book is subtitled “a manifesto,” but it does not provide obvious solutions. “When I was an undergraduate we thought that if we got workplace nurseries, we’d be fine,” Beard said. “Workplace nurseries, equal pay and a few other practical things. The book suggests that, instead of women trying to fit into male definitions of power, society should redefine what power looks like. That, Beard admits, is a giant task.